Club Penguin Cheats by Mimo777 Club Penguin Cheats by Mimo777: Club Penguin Brown Puffle Glitch! Club Penguin Brown Puffle Glitch! Dood! Have you checked on your Brown puffle? I wanted to see how Patty was doing, and look what I got! An orange puffle! Check out my iggy! 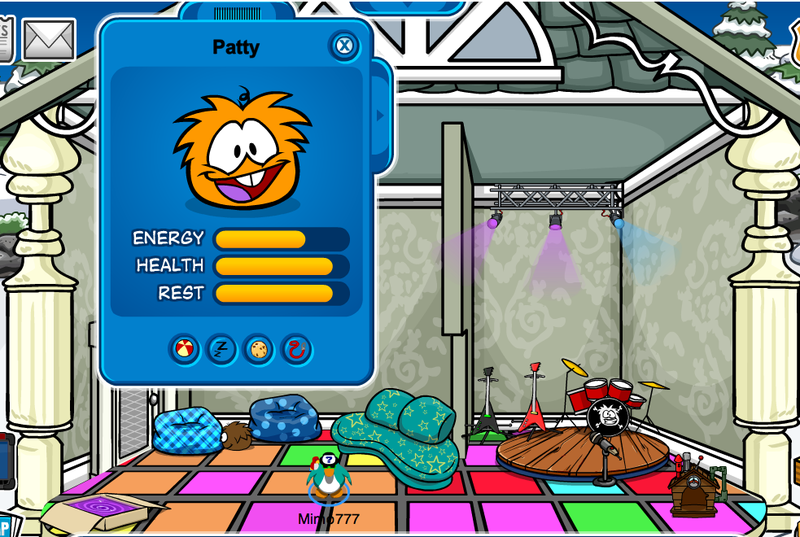 I don't even own an orange puffle! So, does this genius puffle have color changing skillz or is this just another Club Penguin glitch? Listen to Mimo's new album Crazy Wheel! Thats weird same thing happened to me too. I Thought It Was Just Me.. I Went To Check On Tricky.. And Well She Was Orange On Her Little Player Card.. I Said To Myself Im Pretty Sure I Didnt Buy And Orange Puffle.. I Tried Again And It STILL Said My Tricky Was Orange.. I Thought I Was Going Color Blind..
My puffles are too fast even the white puffle have no idea Why I have too fast puffles maybe there currious. its a glitch and everyone who got a brown puffle will have that. I think I know why! The puffles are smaller than they used to be in your house! Anyone knows why the puffles have gone all hyper it is scary my brown puffle is a orange as well. Its good to know im not the only one. 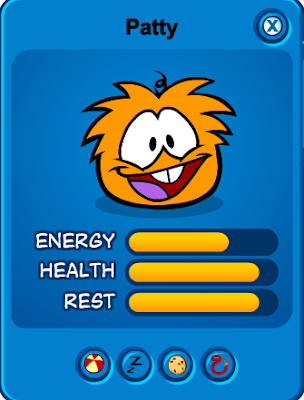 I was about to feed my Brown puffle ( Cadbury, after the chocolate company) and I got a nasty shock when cadburys profile popped up with a orange puffle. I checked my other puffles ( Daisy and Dragon ) but they where still their normal colours. Probably just a bug. Lolz Mimo, Its definetely a Glitch But I like Your suspicions about the Brown Puffle. That happened to me too! That happened to my little bro. grr. this glitch is frustrating. i keep getting my puffles confused. this isn't a cool glitch like the invisible penguin one. yh that's what i got too! Did club penguin eva notice this? 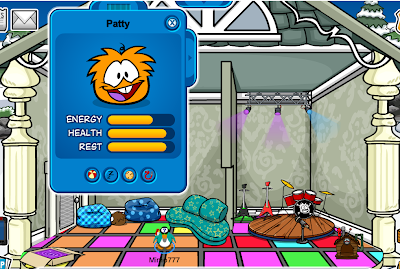 i put my brown puffle in my ball, and it turned to a red puffle! OMG! Club Penguin Coins for Change and Beyond! 2011 Mimo Club Penguin STAMPede Party Clue #3! Brown Puffle Artist Interview by Happy77! Club Penguin Pin Cheat - FIRE EXTINGUISHER PIN! The Penguin That Time Forgot Cheats! Club Penguin Message From Dot! Club Penguin Reviewed By You! Club Penguin's Happy77 Expedition Scavenger Hunt! Another Message From the Director! Club Penguin Weekly Field Op Number 31 Cheats! Club Penguin Brown Puffle House! Mimo Party NOW at Kid Command! PARTY NOW OVER! New Message from G on Spy Phone! Club Penguin New You Decide Pin! Mimo Party on Kid Command NEW VIRTUAL WORLD! Club Penguin Brown Puffle Cave Shortcut! Club Penguin Wilderness Invisibility Glitch! Club Penguin Removes Old Life Jacket!? Club Penguin Wilderness Expedition Start Screen! New Message From Ultimate Protobot! Club Penguin Spy Phone Message From Director! Club Penguin System Defender Game is HERE! Club Penguin Pin Cheat - SLEEPING BAG PIN! Club Penguin Wilderness Expedition News! Club Penguin Threatening Reviewed By You! Club Penguin Weekly Field Op Number 30 Cheats! Club Penguin EPF Sneak Peek! 2011 Mimo Club Penguin STAMPede Party Clue #2! Club Penguin EPF Warning: System Error! Club Penguin January Membership Page! Club Penguin Emergency Message From EPF Director! Club Penguin January Sneak Peek! Club Penguin Elite Explorations News! Club Penguin New Year Reviewed By You! Club Penguin Card-Jitsu Water Update! Club Penguin Coins For Change Billboard Results! Club Penguin Mimo STAMPede Party Clue #1 2011! Club Penguin Pay Day Arrives!